Some say fear is what keeps us alive. Fear is the basic survival instinct that tells us to run, hide and protect ourselves from the beasts and monsters around us. It is that spine-chilling, bone-tingling sensation that creeps up on us in the face of the strange and unfamiliar. It certainly doesn’t sound like something to be excited about, but on one particular night each year, people celebrate the dark and sinister side of life. And on several occasions, people flock to movie houses or gather in front of the tv screen to watch horror movies and shows. To purposely scare our selves is both twisted and fascinating. Is it to prove our selves brave or otherwise? Is it a reminder that such things exist only on screen? Or is it a representation of our real world nightmares and darkest fantasies? Whatever the reason, our obsession with fear is what we all subtly share. 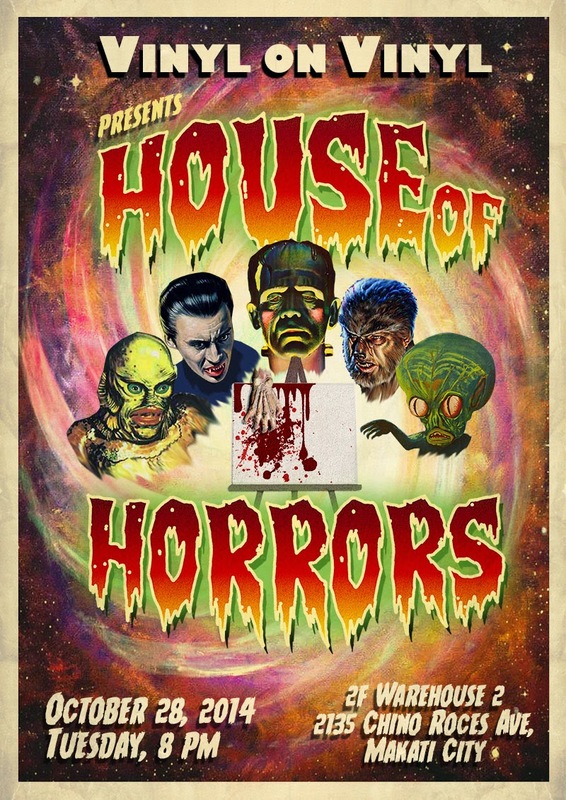 “House of Horrors” exhibits this dark fascination through adaptations of horror movie posters from the 1920’s to the 1970’s. These vintage illustrations were artfully created to entice the audience and add to the suspense of watching an hour and a half long clip of vampires, aliens, zombies and the like. Artists Anjo Bolarda, Lala Gallardo, Yeo Kaa, Keb Cerda, Tano Panaligan, Felix Rosales, Rommel Celestpara, JR Urao, JP Cuizon, Bjorn Calleja, Whooop, Fabo, Rai Cruz, Randy Constantino, Mimi Salibio and Jessie Mondares created paintings inspired by the movie poster they chose with the freedom to incorporate their own personal style.